UPDATE 2: I have fixed this by compiling onscripter with the source code changes that mirror moon made. 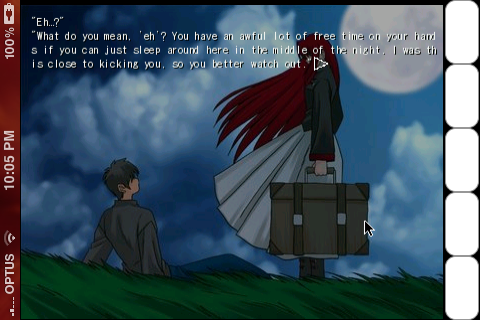 I did some research and found that psp users using onscripter for tsukihime face the same problem probably because mirror moon edited onscripter before using it for their translation patch. 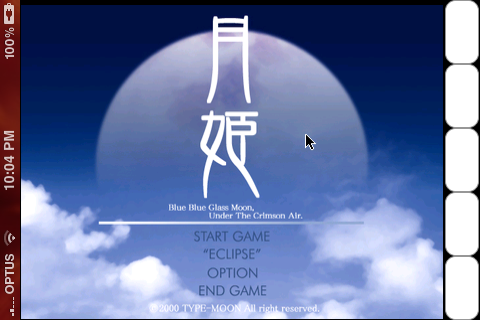 UPDATE: It seems that mirror moon has released a source code patch for onscripter-en to work with Tsukihime. I’ll try to edit the source code for onscripter and compile it for iPhone. I have an idea, we could get a save file with all of the endings completed. In fact, I found one. Thank HoennSquall on Nihonomaru. Thanks. It worked for the PC version, but unfortunately not for iPhone. It just crashes at the Main Menu with the Eclipse option.